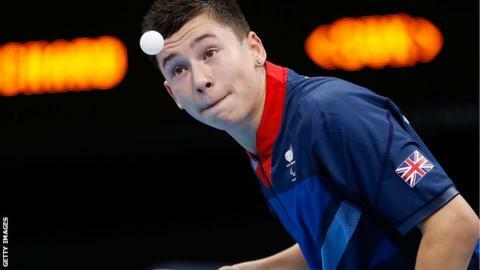 Great Britain's men and women both secured team table tennis bronze with victories over Germany and Italy. In the 6-8 class, the men's team took a comfortable 3-0 victory over Germany. Britain did not lose a game with Ross Wilson, 17, winning two matches, while individual silver medallist Will Bayley clinched the other. The women's pair of Sara Head and Jane Campbell superbly battled back from two matches down to beat Italy 3-2 and secure class 1-3 bronze. Wilson, the world number four, began with an 11-2 11-7 11-5 win over Thorsten Schwinn before world number two Bayley, 24, defeated class 7 gold medallist Jochen Wollmert, having lost to him in the individual final. Wilson then also defeated Wollmert, in what proved to be the final match, to secure the victory. "This means even more to me than my individual medal because for these guys to have already won a Paralympic medal will be such great experience when they go to Rio," said Bayley. Head and Campbell had to battle hard in a five-game thriller to secure bronze after both lost their opening games to Pamela Pezzutto and Michela Brunelli respectively. But Head responded to beat Brunelli 3-1, before Campbell followed it up to win in three games against Pezzutto before the British pair beat Pezzutto and Clara Podda 3-2 in the doubles to secure bronze. "To be down and to come back and win a Paralympic medal is just incredible. I don't know what to say," said Head.